“Indoor Gardening Success” provides the readers with important, practical techniques for selecting and maintaining healthy plants with rich green foliage through a practice of conscious plant care. I found myself intrigued by Rosemary Pine’s concept of becoming a “plant whisperer.” I even tried her technique of “open eye meditation.” However, I was too easily distracted by the traffic passing on the street and the difficulty I had keeping my eyes open as I attempted to empty my mind and focus. Maybe another day! Rosemary goes on to discuss: Laws of observation and the law of allowance. She offers tips and pointers on: How to select a plant, the attention a plant needs, and the art of plant grooming. Over the years I have frequently been a hobby gardener. Circumstances have determined the attention levels my plants receive whether inside or outside, whether in the ground or in flower pots. My plants have often flourished and sometimes been sadly neglected. Currently my inside plant greenery and colorful floral arrangements add a beautiful touch to our comfortable home. The outside flower beds provide a balance of perennial shrubs and flowers with spring bulbs and flowering summer annuals. 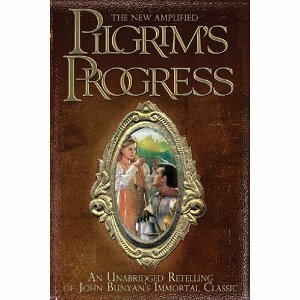 Book Review: The New Amplified Pilgrim’s Progress: An Unabridged Retelling of John Bunyan’s Immortal Classic adapted by Jim Pappas Jr. Even after four centuries John Bunyan’s “Pilgrim’s Progress” continues to retain a high ranking and significant readership in classic literature. “The New Amplified Pilgrim’s Progress” sheds light and clarity on the spiritual riches of the original masterpiece. James Pappas Jr. combines modern language with patterns of speech of Bunyan’s classic writing. Pappas’ adaptation adds a new dimension of adventure and humor by amplifying selected passages; however he takes care to preserve the powerful impact, beauty, and message of Bunyan’s unabridged storyline. Pappas uses his skills as a storyteller to introduce a new generation to the message of love, joy, and hope of Bunyan’s classic masterpiece by zeroing in on the fascination with angels and supernatural beings that intrigue young fantasy readers of today. Memorable original illustrations faithfully depict the picturesque word pictures describing the familiar Wicket Gate, the Slough of Despond, Vanity Fair, the land of Beulah, and many other places Christian passes through along the way. Other illustrations picture the characters, testing, and conflict that confront him throughout his journey. The life changing potential of “The New Amplified Pilgrim’s Progress” makes this an important book for shared family reading, a must for Christian School and Church libraries, and an important classic for every home-schooler’s reading list. Maree Nordgren has beautifully compiled short stories from her life. 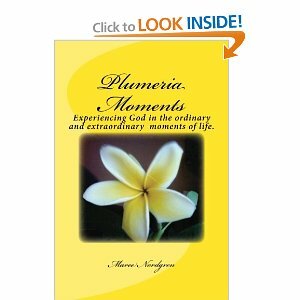 She relates experiences in which God intervened in ordinary and extraordinary moments “Plumeria Moments.” Her book is designed to encourage the reader to take delight in their relationship with God and to recognize those moments when God obviously touches their lives. Maree, her husband Jack, and her family have ministered for over thirty years to a unique assemblage of surfers and beach combers in Hawaii and more recently on the beaches of Lake Michigan. Many incidents from their family life and from the lives of their “parishioners” were included in monthly ministry newsletters. In the introduction to the book Maree relates a unique experience that inspired her to watch for what she now describes as her “Plumeria Moments.” These moments are awe inspiring challenges for devotional contemplation, a call to worship, or a challenge to acknowledge God’s presence personally. “Plumeria Moments: Experiencing God in the ordinary and extraordinary moments of life” is a refreshing read, an effective witnessing tool, or an ideal gift for a hurting friend, or for hospital visitation. Highly recommended. 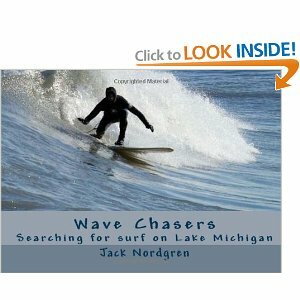 Jack Nordgren captures the excitement of catching and riding the waves of surfers on Lake Michigan “Wave Chasers: Searching for surf on Lake Michigan.” Spectacular photography demonstrates the appreciation and bonding of surfers around the world. The narrative describes the waves, names the surfers and journals the occasion of the event captured. Every surfer will want to expand their experience beyond the book by checking out the numerous suggested websites Jack provides. 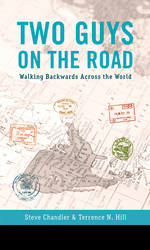 “Two Guys on the Road – Walking Backwards Across the World” is the fifth in the collaborative writing of Steve Chandler and Terry Hill in the “Two Guys” series. I have read and enjoyed three of the earlier titles. I was especially eager to sit back, to fasten my seatbelt in readiness for a memorable, vicarious, new travel adventure. Both authors travel extensively, Terry with his wife Miranda maintain a home in New York City and travel primarily to other countries for pleasure. They enjoy staying for extended periods to absorb a sense of the history, culture, and to familiarize themselves with the local residents. Steve’s travels are mainly within the United States and are usually short trips related to his role as a professional business coach and corporate trainer. He and his wife Kathy make their home in Phoenix, Arizona. Unlike Fodor’, Frommer’s or other typical travel guides “Two Guys on the Road” is filled with the shared life experiences of the authors and the places they have visited. In addition to the travel theme, tips, information, and descriptions, Terry and Steve express opinions and observations on a broad base of subjects: including: international sports, music, art, literature, self-discovery, and the movies. Unique travel tips, references to their favorite restaurants, hotels, museums, and information on various locales gleaned from their wide-ranging travel add the expertise and flavor of a characteristic travel book. Steve and Terry have opened up a whole new dimension, a clearer vision, and a new perspective to me, as I do some “backward” reflecting of my own, on family memories, friendships, and the hundreds of people that have crossed our path throughout the years. I also enjoyed my reflections and glimpses into the experiences and opportunities afforded us as I relived so many reminders of the various cities, states, and communities we have called home. I also treasure the memories of family vacations, combination business/pleasure trip, and shared travels my wife and I have made over the years. “Two Guys on the Road” is a delightful medley of reminisces of old friends. Steve and Terry have a unique style and format of writing that engages the reader, drawing them into their inimitable friendship. An unforgettable reading experience. The “T. N. T. Treasure-Hunters IN Training” is designed as a training model using a Treasure Hunt approach to cover eight key aspects important in producing modern day revivalists. Kevin Dedmon has drawn from over twenty-five years of ministry experiences to develop this proven plan of equipping, empowering, and activating members of the body of Christ to be intentional, specific, and proactive in making an impact on their personal sphere of influence. Dedmon challenges the reader to move beyond acquiring information and theoretical concepts to activating actual first hand experiences in the realm of supernatural living. Each chapter contains practical real life examples, profound insights into scriptural principles, thought provoking questions to stimulate discussion for formulation of applications and action plans for divine encounters, for supernatural ministry in areas of miracles, healing, prophetic insight, and delivery – all with the goal of introducing “God’s Treasures” to Jesus as Savior and Lord. The book is designed for group use to be used over a suggested eight week period. Working within a group of others committed to the purpose will accelerate the learning process as well as encourage the members to “embrace the risk factor” to take the first step in the “Let’s Do It!” section. The specific resources included at the end of the book serve as additional models for developing a local plan or strategy: A plan for creating and using the Treasure Map, a model plan for healing and conducting a Divine encounter, and Study Guide Resources for questions, prayers of impartation, and Treasure Hunt Activities. Kevin Dedmon’s “T. 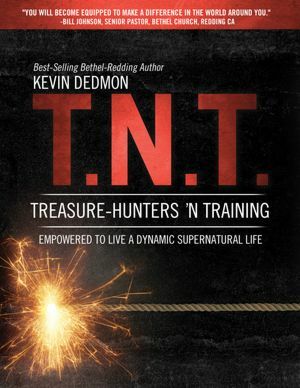 N. T. – Treasure-Hunters ‘N Training” is powerful in dynamic, explosive strategies for equipping and activating a supernatural lifestyle. Illustrations from the lives of Boaz and Ruth, David, Moses, Enoch, Abraham, and many other Old Testament personalities demonstrate how life giving power can be appropriated and shared with others. In New Testament accounts Jesus passed on to his disciples the creative authority to be His representatives as life givers. Joey sets forth principles gleaned from Acts chapter 4 as the disciples from the first century pursued their calling to change the world. I enjoyed the stories of ministry to children and youth in Ethiopia, of the adoption of Anna and power of the relationship notebook. I was captivated by the account of God’s miraculous provision throughout the faith building global trip Joey and Destiny made to bring life to the broken and to empower the powerless. Readers are challenged to join Joey, in the prophetic vision given him, to become a new generation of life givers, living the abundant life already within and to boldly step out in faith as a life giver transforming a new culture with life giving prophetic power. “Healing Through Spiritual Warfare” is Peggy Scarborough’s shares story of her personal journey through healing warfare during her battle with cancer. It is her desire that the book will become a tool used by God to bring healing to those experiencing life threatening illnesses, the suffering of accident victims, and the inconvenience and the discomfort of minor aches and pain. Scarborough helps readers understand what God thinks about healing using examples from the Old Testament, the New Testament, the early Christian Church, and the Church of today. She discusses the impact of the “warriors” lifestyle, three powerful weapons available for healing, God’s battle plan, and healing through warfare prophecy. She also addresses other essential elements to be recognized in the battle for healing: The enemy is Satan and his demons, the will of God is for healing, and warfare must be expected if healing is to be experienced. She includes dozens of Warfare healing principles and practical suggestions for daily living. The book is carefully researched and well documented. In addition to her end-notes a comprehensive Bibliography is included providing suggestions for excellent resources for further study. “Healing Through Spiritual Warfare” boldly proclaims an unapologetic message of healing through spiritual warfare. The book is divided into four parts: Becoming a spiritual person, finding your original self, enjoying Freedom in Christ, and finding peace through praise. A comprehensive study on knowing the mind of God filled with profound theological and spiritual truth, rich in prophetic message. A comparison of theological and philosophical thoughts and concepts. (A look at the carefully documented chapter end-notes documents, validate the accuracy and extent of the research that has gone into this work). A word study with meanings, explanations, use, and applications, provide helpful insight into the translation of significant Greek and Hebrew words used in the text. Practical applications with suggested action steps. The book’s clarity, content, format, and the organization of material make the book an ideal foundational primer for those beginning their spiritual journey. The deep theological understanding and academic approach of the authors offer a refreshing prophetic message to the theologian, independent thinker, and philosopher. A complete set of study notes is provided for individual or group use with suggestions for getting the most from the study. I found the exercises stimulating, causing me to be intellectually circumspect, spiritually honest, and diligent in future research and application. “Battle for the Mind: How You Can Think the Thoughts of God” has created in me a new hunger for knowing and experiencing the refreshing freedom of reconnecting with God, correctly interpreting His thoughts, experiencing victory in spiritual warfare, and grasping the fullness of the prophetic message breathed by the Holy Spirit, and recorded by the apostle Paul in Romans, to know the will of God for my life, the extent of his love, mercy, and grace manifest in Jesus Christ, His Son, my Savior. While on a roller-coaster ride of self-destruction, Marty Angelo experienced the thrills and pinnacles of success and the despair and depression of the pits of personal failure. For fifteen years he pursued a career as a music business entrepreneur. 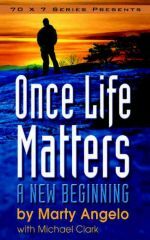 “Once Life Matters: A New Beginning” is his life-changing memoir. Such well-known celebrities from the music industry as Jimi Hendrix, George Harrison, John Lennon, Janis Joplin, and Rob Grill all had a part in Marty’s rise to success as a manager and promoter. Although outwardly successful, Angelo was searching for more, for meaning. During this fifteen-year journey he experienced the powerful hold of drugs, alcohol, and rock/disco music on his life. In March of 1981 Angelo had reached rock bottom. It was at this point that Marty experienced a dramatic and powerful life-changing conversion to Christianity. Since that time, he has become a strong witness of God’s saving grace, mercy, and forgiveness. Since his conversion in 1981, Marty has served significant roles in full-time ministry with Chuck Colson’s Prison Fellowship, as a counselor with Teen Challenge, and as director of evangelism and court liaison with the Faith Farm Ministries. Angelo’s writing is engaging, entertaining, informational, and inspiring. He made himself vulnerable, exposing his weaknesses as well as his strengths. I appreciated the no-holds-barred approach in telling his story, balancing the message of his newfound life as a follower of Christ with his experiences in the music industry and well as a glimpse into his life while serving time in the Federal prison in Lexington, Kentucky. Marty views this book as a ministry. It is his prayer that readers will discover the truth of God’s Word and be motivated and encouraged to take a stand for God. This is a book that will challenge hearts, offer hope, and I believe it will change lives, which is, I am sure, exactly what Marty intended it to do. I feel confident that “Once Life Matters” has that kind of potential.